From this point to the end of the season, who would you rather have — Jose Bautista or Adam Lind? This question would have been almost unimaginable at the start of the year. Lind was drafted on average in the fourth round of a 12-team mixed league. Bautista would have only found his way onto rosters in the deepest of AL-only leagues. Now, the choice between Blue Jays outfielders may not be so easy. Bautista is leading the majors in HRs with 14. We also have to consider the fact that he hit eight last September, which gives him six (!) more total HRs than any other player in the entire major leagues over the last three months of professional baseball. A look at Bautista’s peripheral numbers shows he’s increased the frequency with which he puts the ball in the air from 42% to 52% – a good sign for a burgeoning power hitter. His home run-per-fly ball rate shows him at 21%, about twice his career norm, which indicates he’s getting somewhat lucky. On the other hand, whatever ground he might lose in his HR pace in the forthcoming months, he may make up with his unlucky, languishing average. Right now, he’s hitting just .242, but he’s been victimized by a BABIP around .230. As for Lind, he’s been a disappointment so far with 7 HR and a .231 average. Most of Lind’s peripherals coming out of 2009 indicated he was legitimate and might even improve further, but he’s struggled this year. His strikeout rate is up to an atrocious 26.6%. His ISO (slugging average minus batting average) is down from .257 to .168. Lind may be suffering from slight bad luck, with a BABIP at .270 and a HR/FB rate below his career norms. But nothing so drastic that one can point to luck as a major factor in his troubles. He simply hasn’t gotten it going this year. Bloomberg Sports projections (on the right) still have Lind the clear favorite to be the more valuable Blue Jays outfielder for the rest of the year. However, there’s certainly a case to be made that Bautista is the preferable fantasy option. Adam Lind definitely has a better pedigree, once a top-40 prospect, according to Baseball America. However, Bautista didn’t come out of nowhere. He has long been regarded as someone with potential, although he’s taken a trip to a few different ball clubs to show it. Track record of success favors Lind only slightly. Bautista has never put up an entire season like the one that Lind produced in 2009, but then again, that’s pretty much all that Lind has to show on his ledger besides some dominance at the minor league level. Does one full season outweigh three months? Sure. But by how much? Lind gets some credit for history, but we now have to weigh the present — and it’s clear that Bautista is doing much better. Apparently, Bautista retooled his swing and although it’s hard to expect a major leap forward in skill level at the age of 29, he’s flashed enough power throughout his career and is still at an age where we can’t write off two months (or three, counting September) as a complete fluke. Plus, he’s got 3B eligibility and Lind doesn’t. Bautista’s season has the makings of a career year — one he may never match again — but at this point of the season, it seems more probable than not that Bautista will finish with better year-end numbers than Lind. Give us the choice between the two in a “challenge trade,” (what will happen just from now to the rest of the season), though, and we’d agonize over it for a long time and feel very unsettled about the decision. Right now, we could argue in both directions, and probably side with Lind only because of the emotional scars that would ensue by watching him heat up on a competitor’s team. That said, some teams desperate for a shakeup might prefer the hot hand, and since we can’t make a strong case that luck, track record, or home environment weigh strongly on this decision, one wouldn’t be crazy at all to choose Bautista among the two. 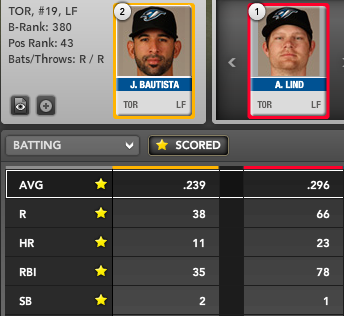 For more on Jose Bautista, Adam Lind, and the rest of the Toronto Blue Jays, check out Bloomberg Sports’ Fantasy Tools. Maybe you’ve factored this in when you say Bautista has six more HR’s over the last three months than anyone else, but you didn’t mention that not only did he hit eight last September, he added another two in three October games. All this from a guy who hit only three HR’s in 273 plate appearance over the first five months of last season.